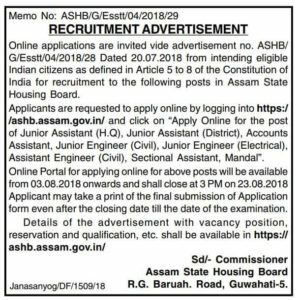 Online applications are invited from intending eligible Indian citizens for the recruitment to the following posts in Assam State Housing Board. Pay: Pay Band (2) Rs. 5,200- 20,200/- + Grade Pay Rs. 2400/- p.m.
a) Bachelor Degree in Arts/Science/Commerce from a recognized University. b) Must possess Diploma in Computer Application minimum for six months from a recognized Institute. Pay: Pay Band (2) Rs. 5,200- 20,200/- + Grade Pay Rs. 2200/-p.m.
b) Must possess Diploma in Computer Application for minimum six months from a recognized Institute. Pay: Pay Band (2) Rs. 5,200- 20,200/- + Grade Pay Rs. 2400A p.m.
b) Must possess Diploma in Computer Application for minimum six month from a recognized institute. c) Knowledge in Accounts keeping with Tally latest version is also required. Pay: Pay Band (2) Rs. 5,200- 20,200/- + Grade Pay Rs. 3300/-p.m.Educational Qualification: Diploma in Civil Engineering from an institution recognized by the Central/State Government. Preference will bo given to candidates having experience of 3 years. Pay: Pay Band (2) Rs. 5,200- 20,200/- + Grade Pay Rs. 3300/-p.m.
Educational Qualification: Diploma in Electrical Engineering from an institution recognized by the Central/State Government. Preference will be given to candidates having experience of 3 years. Pay: Pay Band (4) Rs. 12000- 40,000/- + Grade Pay Rs. 5400/- p.m.
Educational Qualification: Bachelor Degree in Civil Engineering from an institution recognized by the Central/State Government. Preference will be given to candidates having experience of 3 years with AutoCAD knowledge. a) Minimum educational qualification is HSSLC or equivalent from a recognized Board. b) Must possess 3 month Diploma in General Works Supervisor from a Govt. Recognized Housing Development Institute and NCVT. Pay: Pay Band (2) Rs. 5,200- 20,200/- + Grade Pay Rs. 2200/- p.m.
Educational Qualification: Minimum H.S.L.C. examination or equivalent examination with 6(Six) months Recorders’ Course Class Certificate from the Assam Survey and Settlement Training Centre, Dakhingaon, Guwahati. Age : Applicants must not be less than 18 years and more than 44 years of age on 01.01.2018. However, the upper age limit relaxation in case of SC, ST & other applicants as per Govt. OM No.ABP 06/2016/04 dated 3rd March 2016 and prevailing Govt, norms. i. Rupees 350.00 for General and OBC candidates. ii. Rupees 200.00 for SC, ST (P) and ST (H) candidates. iii. No application fees in respect of BPL and PH candidates. How to apply: Applicants are requested to apply online by logging into https://ashb.assam.gov.in/ and click on "Apply online for the post of Junior Assistant (H.Q), Junior Assistant (District), Accounts Assistant, Junior Engineer (Civil), Junior Engineer (Electrical), Assistant Engineer (Civil) Sectional Assistant, Mandal". Online Portal for applying online for above posts will be available from 03.08.2018 onwards and shall close at 3PM on 23.08.2018 . Applicants may take a print of the final submission of Application form even after closing date till the date of the examination. Advertisement Details: Pl check here & here.